You hope you never need it but having it available just in case is always nice. The SafeTHammer is a great item to have. It gives you two items in one. 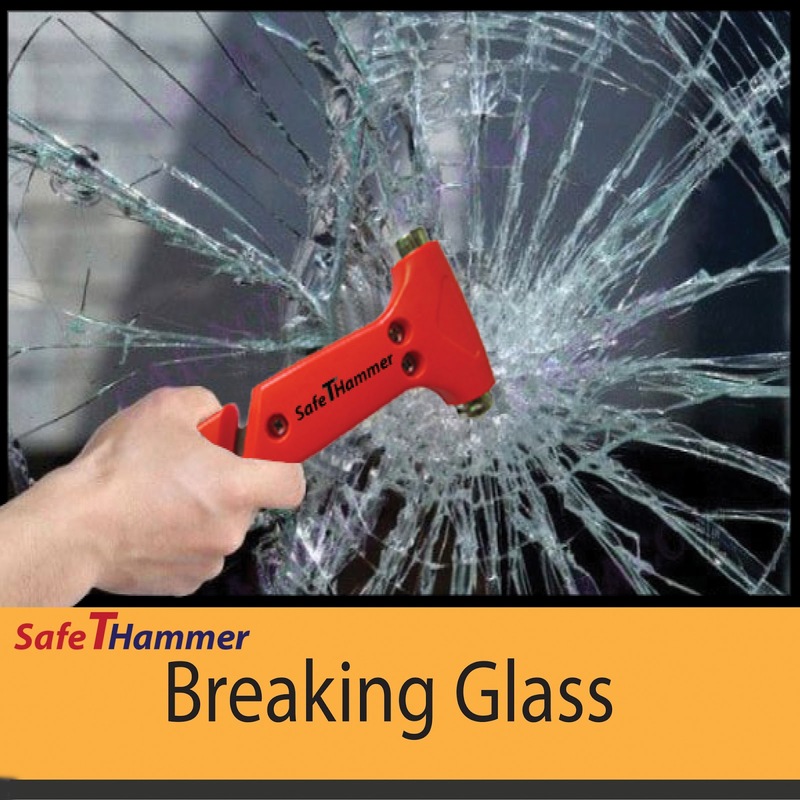 A hammer to break glass in your auto say if you plunge off a bridge into the water, and a cutter edge that can be used to cut a seat belt in the case where your seatbelt will not disengage. The SafeTHammer comes in a two pack so you can keep one in two different cars. You can purchase the Easy Peasy To Use Car Emergency Safety Hammer. What SafeTHammer has to say about their product. 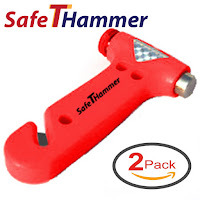 Car Safety Hammer by SafeTHammer is a Great Emergency Preparedness Window Breaker - Comes in a Twin Pack and Functions as a Seat Belt Cutter Auto Escape or Rescue Tool Glass Breaker - Great For Vehicle Emergency Kit - Great To Have One For Each Automobile, Truck, SUV - Avoid Roadside Disaster And Add To Your Auto Emergency Kit. When Would You Need A Rescue Tool? How Many Have Said In The Past It Won't Happen To Me? Perhaps A Car Crash, A Fire, A Flood, A Tornado And More... Perhaps Even An Earthquake?We certainly hope it does not happen to you, but we all need to be prepared in any disaster just in case. In a roadside emergency it is the first 60 seconds which can literally mean the difference between life and death. This car safety hammer by SafeTHammer enables you to escape quickly after a vehicle accident roadside emergency. 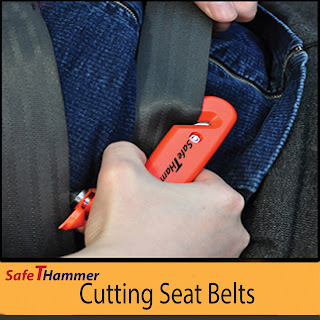 Seatbelts are safe yet in a vehicle accident they can also be the very thing that hold you trapped. 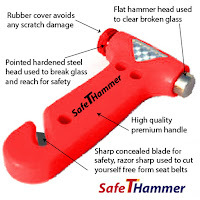 Instead of being stuck in what may be potentially a ball of flames or a sinking car feel reassured that you are prepared with an auto safety hammer. Place in your vehicle emergency kit and have ready the best window breaker. Shatter those windows very quickly keeping in mind most cars these days have electric windows which importantly do not work without any power Emergency preparedness is sensible and this auto rescue tool easily becomes part of your auto emergency kit . A very small cost to pay for 2 essential escape tools. Put one of these tools in your glove box now and consider the other for someone you care about, as it can save lives.Do you have a car tool kit or safety kit? Consider placing not one car safety hammer in each of your vehicles.Remember this is a twin pack purchase, so buy now for you, your family, friends, loved ones. Add it to your car emergency kit today as it may be truly life saving- be prepared for any auto rescue or personal emergency and have peace of mind at a tiny cost. Disclosure: MarksvilleandMe received one or more of the products mentioned above as part of a promotion with Tomoson and SafeTHammer. Regardless, MarksvilleandMe only recommends products or services we use personally and believe will be good for our readers. Some of the links in the article may be “affiliate links.” This means if you click on the link and purchase the item, I will receive compensation. If you would like MarksvilleandMe to review a product or service please contact us at marksvilleandme@gmail.com.